During the past two decades, many books, governmental reports and regu­ lations on safety measures against chemieals, fire, microbiological and radioactive hazards in laboratories have been published from various coun­ tries. These topics have also been briefly discussed in books on laboratory planning and management. The application ofvarious scientific instruments based on different ionizing and non-ionizing radiations have brought new safety problems to the laboratory workers of today, irrespective of their scientific disciplines, be they medicine, natural or life sciences. However, no comprehensive laboratory handbook dealing with aIl these hazards, some of which are recently introduced, had so far been available in a single volume. 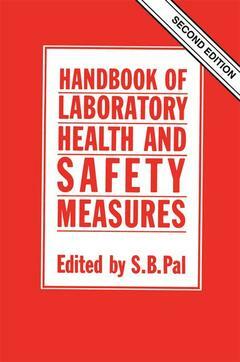 Therefore, it was thought worthwhile to publish this Handbook on safety and health measures for laboratories, with contributions from several experts on these subjects. As this second edition of the Handbook, like the first edition, is a multiauthor volume, some duplication in conte nt among chapters is unavoidable in order to maintain the context of a chapter as weIl as make each chapter complete. An attempt has also been made to maintain the central theme, which is how to work in a laboratory with maximum possible environmental safety. 1 Organizing the design of a safe laboratory.- 2 Electrical safety measures and standards for laboratory facilities and equipment in hospitals and laboratories.- 3 Design of mechanical equipment for laboratory staff and patient safety.- 4 Handling of laboratory animals — including non-human primates.- 5 Health care of laboratory personnel.- 6 Responsibilities of the Director of Laboratory Medicine for health and safety issues in the laboratory.- 7 Health and safety hazards and precautions in chemical laboratories.- 8 Safety measures to be taken in a haematological laboratory.- 9 Health hazards in microbiology.- 10 Safety measures in a clinical chemistry laboratory.- 11 Safety precautions in a clinical cytogenetics laboratory.- 12 Safety measures to be taken in a botany laboratory.- 13 Safety measures to be taken in a zoology laboratory.- 14 X-ray hazards — diagnostic and therapeutic.- 15 Precautions to be taken when working in an X-ray crystallography laboratory.- 16 Radiation protection in radionuclide investigations.- 17 Ultraviolet radiation safety.- 18 Hazards of using microwaves and radiofrequency radiation.- 19 Applications of ultrasound and their potential hazards.- 20 Safety aspects of laboratory and clinical nuclear magnetic resonance and magnetic fields.- 21 Laser safety.- 22 Precautions to be taken by field workers relating to specimens collected for final analysis in the laboratory.- 23 Safety measures to be taken when moving to a new laboratory.